Hi everyone! 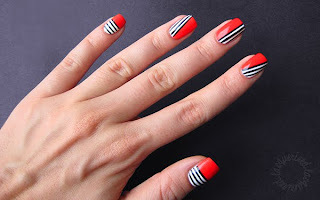 Last night I was browsing the internet and stumbled upon such a cute nail art design. It didn't see whose idea it was, so unfortunately I cannot give credits where due, but I loved it! I know this isn't the most subtle design, but strangely enough it isn't bothering me, at all. I was afraid it'd be really difficult to recreate, being a major nail art n00b, but to my surprise, it wasn't! Edit: thanks to Ashley I now know who to credit! The design is by Wah Nails. Definitely check out their other designs, they're fantastic! The polishes I used were H&M's Love at First Sight, Eyeko's Coral Polish and a black striper by Nailstar. I used the white creme by H&M for the base color, and I was really pleased with this polish. Where a lot of white nail polishes are streaky and sheer, this one is really opaque. It was a bit thick though, but it only took me 2 layers to get an even result. I also used Eyeko's Coral Polish, on which I wrote a review here. The color in the pictures isn't that accurate, because I had to resort to a different camera today! Now, the striper is really good. I've tried other stripers in the past, but this one has the best brush, ever. It's really long and tapered, which makes creating straight lines quite easy. It also has a pen, which makes freehand drawing easier as well. Well dear readers, I hope you liked this post! Thanks so much for stopping by and have a great day! Eyeko products are available at www.eyeko.com, Nail Star stripers can be found on eBay and H&M cosmetics can be found at some H&M stores in Europe.